Francis E. Townsend was a retired doctor who (unlike Abraham Lincoln) was born in a log cabin in northern Illinois. He moved to the Los Angeles area, lost most of his savings in the stock market crash of 1929 and was forced to re-enter the medical profession. Townsend chose to focus on care for indigent elderly persons in Long Beach and his experiences in that environment prompted him to consider ways in which America could take care of its older citizens. Eventually, he concluded sales taxes could be used to develop a pension for persons over sixty-years of age. On September 30, 1933, the sixty-six year old Townsend began his great political adventure with a letter to the Editor of the Long Beach Press Telegram. He then wrote additional letters to several newspapers and began circulating petitions. 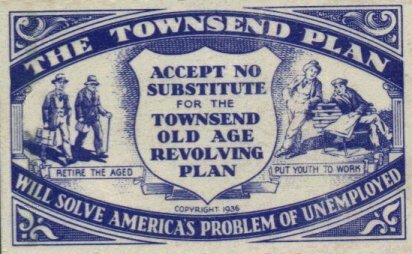 In February 1934, Townsend formed Old Age Revolving Pensions, Ltd., which spearheaded a national movement for a pension plan. Within fourteen months, there were fourteen thousand Townsend Clubs with memberships ranging from one hundred to seventeen hundred. Publicity surrounding later congressional hearings boosted interest and support in the Townsend Plan to the point that Townsend was able to boast of more than three million supporters and a Weekly with an annual circulation of seventy-five thousand. On April 1, 1935, John McGroarty introduced the official bill of the Townsend movement in the House of Representatives (H.R. 7145). It called for a two hundred dollar a month pension to every citizen over the age of sixty who was not a convicted felon. Pension funds would be derived from a two percent tax on “gross dollar value” of each business, commercial and/or financial transaction. The President could, at his discretion, raise or lower the tax from one to three percent. “Individual services” were exempt from the tax. The Act required pensioners to be retired and the two hundred dollars be spent somewhere in the United States within thirty days. The Plan also described itself as “the first nation-wide mutual retirement plan ever devised” for intelligent “care of the aged.” Twenty million people signed petitions asking Congress to approve of the legislation. 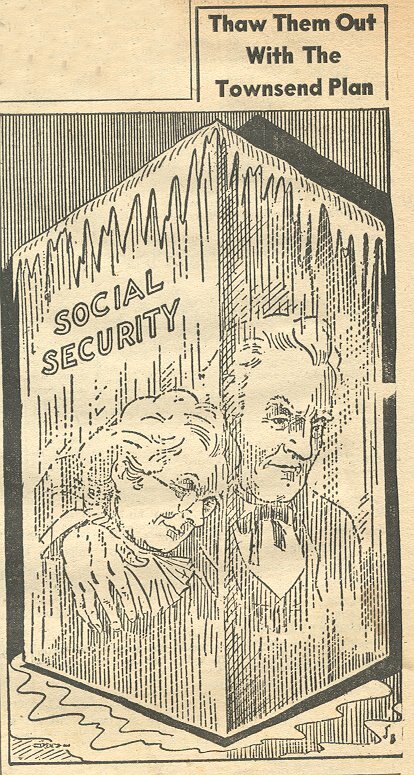 The plan that began as a “letter to the Editor” was now officially the primary contender to Franklin Roosevelt’s Social Security plan. Members of the President’s party in the House and Senate found themselves inundated with Townsend petitions and “carloads” of letters. Sensing their need to balance respect for the President’s wishes and the need to treat the Townsend Plan seriously, they called Dr. Townsend before congressional committees. Townsend made three appearances before the House Ways and Means Committee and the Senate Committee on Finance. Committee Chairman C. Jasper Bell was not so amused. He loudly ordered guards to “stop” and “hold” Townsend. But, the guards simply smiled at the old man and assisted him on his way out the door. Townsend was charged with a misdemeanor under Title 2, Section 192 of the United States Code and convicted on February 24, 1937. On March 12, Townsend was sentenced to serve time in the Washington asylum for thirty days. He was also fined one hundred dollars. 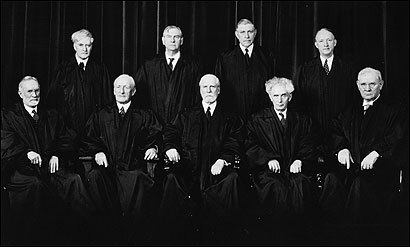 Townsend appealed his conviction, but the United States Court of Appeals for the District of Columbia upheld the decision on February 7, 1938. On April 11 of that year, the United States Supreme Court announced that it would not give the case further consideration. It seemed like almost everyone really important recommended clemency for Dr. Townsend, and each recommendation appeared to come with a guarantee of media attention. Representative O’Connell asked Roosevelt to pardon Townsend on February 19. O’Connell suggested that “persecuting” a man “who, with sincerity and honesty, attempted to give security to old age in the community” was “undemocratic and Un-American.” O’Connell called the House Committee hearings “one of the blackest spots” in Congressional history. Senator Burton Wheeler (D-Montana) announced his support on February 20. On April 13, Senator William McAdoo (D-California) asked the President to pardon Townsend. On April 15, Representative Bell (D-Missouri and Chair of the Committee Townsend walked out on) asked for a pardon. Senator Patrick McCarran (D-Nevada) and Representative John McCormack (D-Massachusetts) announced that they were in favor of a presidential pardon on the same day. McCarran described Townsend was a “kindly old gentleman.” and observed that jailing the founder of the Old Age Pension movement would simply create a “martyr.” Representative Joseph Hendricks (D-Florida) met Townsend at the airport on April 17 and told reporters he had “reasonable assurance” a pardon would be issued, if Townsend desired one. Eventually, the Speaker of the House and the majority leader recommended clemency. As Dr. Townsend got closer to actually going to jail, however, he seemed to have a change of heart. On April 17, he was asked again about taking the initiative to request a pardon. This time, Townsend said he did not wish to discuss the matter until he had spoken with his attorney. On a lighter note, Townsend (who had brought a type writer to jail in order to write a book) suggested that he would miss the standard jail menu items - bacon and beans. Before he returned to sunny California, Townsend met with President Roosevelt to express his gratitude for the pardon. The meeting was originally scheduled for five minutes, but lasted a full half an hour. The aged and relatively dim-witted Townsend evidently duped the President of the United States into a discussion about policy. The creator of the famous pension plan was so proud of his presidential pardon that he dedicated an entire chapter to it and displayed a reproduction of it in his autobiography, New Horizons. Dr. Townsend was somehow under the impression that he was the first person “in history” to receive an “unsolicited” pardon. History was not Townsend’s forte. His autobiography also noted that a presidential secretary had written him asking for the pardon so that a copy could be made. Townsend implied that he refused to assist in that matter.